2012 Ford Tourneo Custom review | What Car? 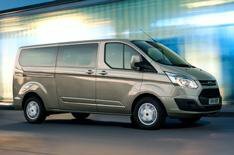 The new Ford Tourneo Custom is a car for people with really big families. While there are plenty of seven-seat MPVs on the market, the Tourneo has up to nine seats. It's a people-carrying version of the new Transit Custom van the smaller of two forthcoming Transit models and it's available to order now. Ford has designed the Tourneo to be a bit posher than your standard minibus, giving it carpets and plastic wall mouldings rather than a rubber floor and ply-lining. What's the 2012 Ford Tourneo Custom like to drive? For something that's based on a van, it's sensational. The first thing that strikes you is how civilised it is. Wind and road noise are brilliantly suppressed, and the 2.2-litre diesel engine stays smooth and subdued most of the time. The engine comes in three forms: 99bhp, 123bhp and 153bhp. We drove the two higher-powered versions. Neither is especially quick, but as long as you keep the revs above 1500rpm, there's decent performance. The only real difference is that the weaker of the two units transmits a shade more vibration through the steering wheel and pedals. The Tourneo's ride also impresses. It's at its best when youve got a few people on board, because the van suspension underneath is designed to carry heavy loads. Travelling three- or four-up, the suspension takes the sting out of most nasty bumps and stays nicely controlled. Things deteriorate a little when you're on your own the ride feels more fidgety, and there's the odd thunk through the back axle. The Tourneo is much more comfortable than other van-based people movers we've experienced, even if it's not as supple as the best MPVs. It doesn't handle badly, either. It's perfectly secure, alhough the tall body leans over a fair amount if you enter a bend too quickly. The steering has reassuring weight, yet it's light enough at low speed to make parking manoeuvres reasonably easy. The surprisingly tight turning circle helps on that score, too. In short, the Tourneo is a comfortable and civilised vehicle, both to drive, and to be driven in. What's the 2012 Ford Tourneo Custom like inside? The Tourneo comes with eight individual seats as standard two up front, three in the middle and three in the back but for an extra 100 or so, you can add an extra front seat. All nine chairs will comfortably accommodate a tall adult because the cabin is enormous. The knees of the folk in the third row won't come close to touching the backrest of the seat in front of them, and the middle seats have truly immense legroom enough to put many limousines to shame. The Tourneo also has a very high roof that means masses of headroom for all, while the huge sliding doors on either side make it easy to get into and out of, especially in tight parking spaces. The boot is enormous, even with all the chairs in place; its 922-litre capacity is enough to cope with multiple pushchairs, bags, suitcases you name it. Thats the short-wheelbase model, too. The long wheelbase version, which costs 890 more, increases the cargo space to 1447 litres. In both, the seats can also be flipped down and tumbled to give you various load-carrying configurations. It's no surprise that, when the seats aren't needed, you can have incredible cargo capacity: 5520 litres in the short-wheelbase version and 6336 litres in the long-wheelbase model. Sadly, achieving those figures is a massive pain. The seats don't fold away into the floor like they do in most purpose-built MPVs, so you have to lift them out entirely. This takes some serious muscle because they're extremely heavy, and you also have to find somewhere to store them. The infotainment system might annoy you, too. It's the mobile phone-inspired system that's in the Fiesta and Focus, and although the buttons are bigger and easier to hit than in those cars, the screen remains small and the menus rather confusing. Still, the high seating position gives you a real king-of-the-road view out. Lots of glass and slim pillars on all sides of the Tourneo, plus enormous door mirrors, make all-round visibility great it needs to be when you're trying to park something of this size. Build quality is impressive. The plastics used are nicely finished and feel impressively sturdy. In fact, the whole vehicle has a meaty, built-to-last feel; when you see a 20-year-old Transit rolling around, it should come as no surprise. The Tourneo starts at 28,285 and tops out at 33,495. That makes it a lot more expensive than the Hyundai i800, but a good bit cheaper than the Mercedes Viano. The Tourneo is superior to both, though, and it offers you the option of one more seat. So, if you need as many chairs as you can muster, the Ford is where our money would go. Running costs shouldn't be too bad, either. All three diesel engines average 43.5mpg in short-wheelbase models and 42.2mpg with the long-wheelbase car. Again, thats better than most competitors. However, if you can live with a seven-seat MPV, wed advise that you do. Yes, the Tourneo has its strengths over cars such as the Seat Alhambra and VW Sharan, but it's also much more expensive and not nearly as clever. In addition, while its sensational to drive for something based on a van, its still not quite as good as these car-based rivals.